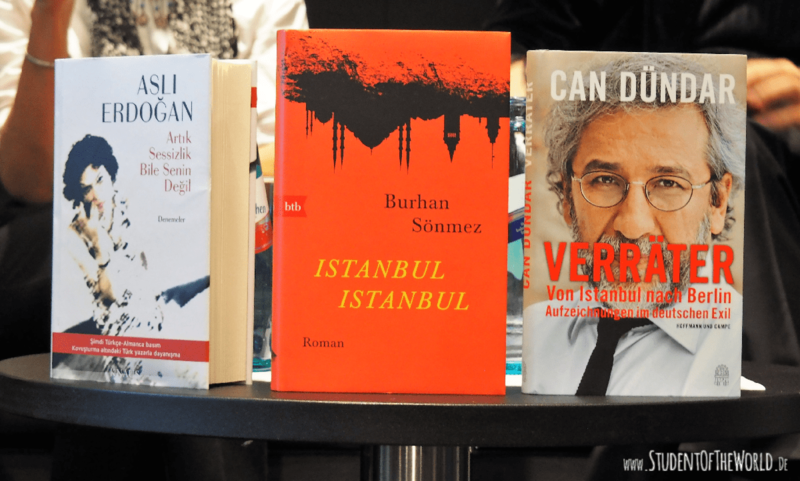 Can Dündar, Asli Erdogan, and Burhan Sünmez are three Turkish authors who are or have been working in exile. At the Frankfurt Book Fair they shared their histories, projects and views on the freedom of speech. Mr. Dündar and Mrs. Erdogan have both been in prison in Turkey, partially in solitary confinement. “Solidarity is crucial in prison. It is the last tie to life for the 180 authors and journalists who are still in jail,” said Asli Erdogan who was released from prison after four months in January. Authorities didn’t issue her passport until early September. Although she is free now, the process against her continues and the prosecution filed for a lifelong sentence. The irony of a once relatively healthy state that is now falling apart: Mrs. Erdogan found her own books in the prison library during her confinement – the books she was imprisoned for. Asli Erdogan’s aim is to reach the younger audience with her books. A trained physicist and journalist she writes novels about the atrocities against Kurds in Turkey. “My role as a writer is not to shout at people. But to whisper into their ears,” she explains. Can Dündar, on the contrary, wants to scream and shout: “The government controls the media. We want to give a voice to the voiceless”. He was once the editor-in-chief of Cumhuriyet, one of Turkey’s oldest secular newspapers. For one year he has been in exile in Berlin. That’s where he started the website and magazine özgürüz which means “we are free”. The website is available in German and English. However, before any articles were published, the website was already blocked in Turkey. 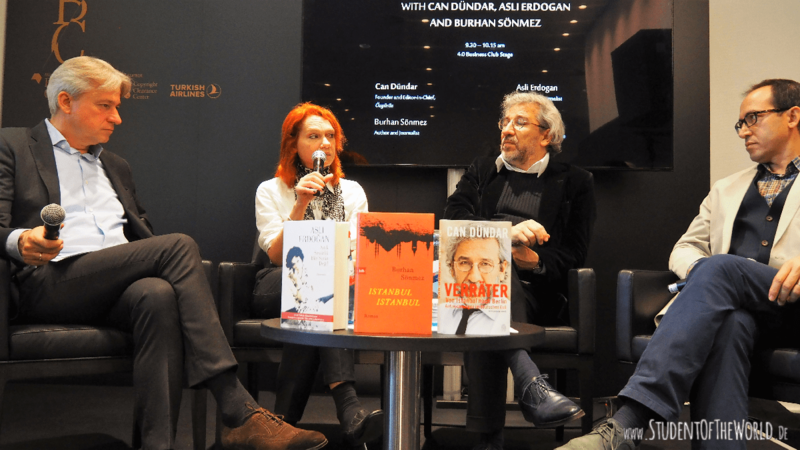 “Luckily people in Turkey know how to circumvent censorship,” said Mr. Dündar. For the German national newspaper Die Zeit he writes the column Meine Türkei (my Turkey). Burhan Sönmez is an author and human rights lawyer. After being injured by the Turkish police in 1996, he received medical treatment in Great Britain and lived there for ten years. He returned to Turkey when he thought the situation had improved just to find out he was wrong. Mr. Sönmez teaches creative writing and is a member of the PEN club for writers in exile in both, Great Britain and Turkey. One sponsor of a panel discussion about exiled Turkish Authors: Turkish Arilines! for translations of foreign books into Turkish. The irony of the entire situation: Turkish Airlines is one of the major sponsors of the exclusive Business Club in which the panel took place. The authors pleaded that isolating Turkey would support president Erdogan. “Turkey doesn’t belong to Erdogan. It belongs to us. Don’t boycott Turkey. Come visit us,” said Sönmez.